CQ CQ CQ #HamRadio Saturday: Zuhlsdorf’s Law strikes again… and again. Last week I wrote that I passed my Extra exam, to upgrade my license. Really. I did actually pass. So, I patiently checked the FCC site every couple days to see if the upgrade was posted. No joy. Then I was sent this by one of the VEs. It’s a blurb in the ARRL VE Newsletter July 2016. The FCC information technology staff is continuing to look into why the Universal Licensing System (ULS) Electronic Batch Filing (EBF) system has stopped processing at least some — and perhaps all — Amateur Radio exam session files and applications. The stoppage, which began on June 28, initially affected the handling of all Amateur Radio Volunteer Examiner Coordinator (VEC) and commercial license applications, said ARRL VEC Manager Maria Somma, AB1FM, who alerted the FCC IT Department. Somma said that by June 30, it appeared that the FCC had corrected the broader problem, and processing of most Amateur Radio VEC and commercial applications and exam session files had resumed. According to Somma, resolving the problem has been escalated to Priority 1 at the FCC, and resources have been reprioritized to address the issue. Somma said that as of July 6, the ARRL VEC had more than 900 applications and nearly 275 exam sessions in the queue and awaiting FCC processing. This new story can be found on the ARRL Website. We thank you and your candidates for being patient while we work through this issue with FCC. So, there it is. I am in Extra Limbo. But I DO have my ticket! I do! I was chuffed about passing the exam, so the next day I loaded up my stuff and went out to my usual operating spot in the parish cemetery. It’s beautiful, I can pray for the dead, and they don’t mind that I’m around. And, in that appropriate place, my radio died. I’ll spare you the details, but as I was tuning up there was a whirrrrrr and now I can’t change frequency and the display doesn’t work. “Caramba!”, quoth I. Or words to that effect. Some of you may not remember it. Corollary 1: When you need your technology to work, that is when it will fail. Corollary 2: The extent of the failure is proportioned to the urgency of the need. Corollary 3: When you want to show someone the great gizmo or program you have, that is when it won’t work. Corollary 4: When the person to whom you wanted to show off your great gizmo or program departs, unimpressed, that is when it will once again begin to function properly. Someone should update the Wikipedia list of eponymous laws. Of course that probably bust the website. I got on the horn to my local Elmer who is always helpful. He had recently done some research on a new radio for his own use and, knowing my (lack of) experience made a recommendation. Frankly, I was ready to get a new rig. I really like the old Kenwood that one of you readers sent, but this is a good time for an upgrade. I’ll get the older transceiver repaired. I have a plan for it. So, it was off to Milwaukee and the only Ham Radio store in any direction for hundreds of miles. I now have a new rig. Zuhlsdorf’s Law wasn’t finished with me. I’m like the kiss of death these days. I return from Milwaukee and find this in my email the next day. Folks, don’t let me come near anything that you hold dear… at least for a few more days. Anyway, I have ordered up some monel wire and insulators and, soon, will brew up an antenna with the help of my local Elmer. But, Caramba!, it has been a tough ham radio week. You know the one about the pessimist and the optimist, right? This entry was posted in Ham Radio and tagged CQ, Ham radio, Ham Radio Saturday, Zuhlsdorf's Law. Bookmark the permalink. 14 Responses to CQ CQ CQ #HamRadio Saturday: Zuhlsdorf’s Law strikes again… and again. When I had a job and we had days like this, my horoscope reading coworker would often comment something about Mercury being in retrograde. But we know Barrie, don’t we! I hate auto correct! I thought I typed “better”…where on earth did “Barrie” (capitalized and all) come from???? Any hope of Sr. Campbell and the Nuns on the Bus explaining why the FCC, an agency of the U.S. federal government, still needs to license ham radio operators? Oh, come on now. 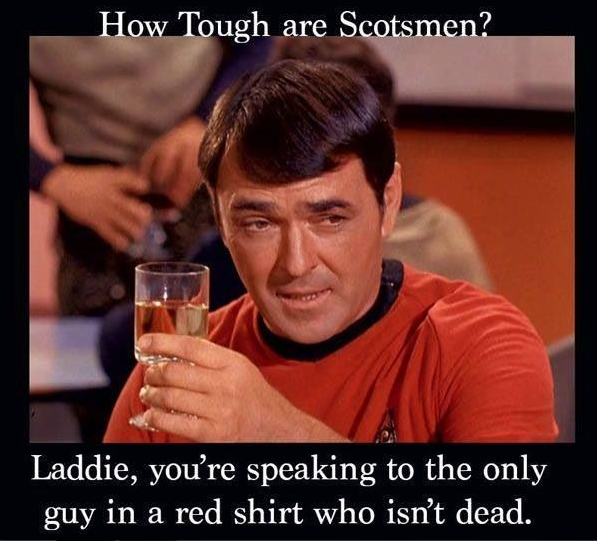 Scotty wore a red uniform for years, and he was still alive on stardate 46125.3 to meet Cpt Picard and crew. …and now I’d better stop. Have you looked into vanity call signs yet? Father, presenting your travails with a touch of humor makes me smile, thanks. Are not the Democrats looking for tech assistance at their convention? Heh. Hey… you’re on to something. And maybe I could lend a hand at the annual conflab of the LCWR! Maybe you should say a Low Mass for a few days, Father. Wouldn’t want to set anything on fire with the thurible. The demise of A.E.S. leaves Ham Radio Outlet as the last major distributor/supplier. I first ordered from A.E.S. more than 40 years ago. It’s sad to see it go. WFR7 or KFR7, huh? Indeed, a very bad suggestion that would get instant application dismissal by FCC. Besides, who does not know about W9FRZ? 590SG is a beaucoup fine rig. Glad to see you’ve stayed with the Kenwood meme. And, with the built-in matching system (or tuner as some call it), there isn’t much you can’t load to get you on the air. Waiting for mine to come in, to retire my TS830. It’s Okay Fr. We still love you. We must all ask Our Lady to kiss Fr. on the head and dispel any hint of…..Murphy’s Law or any of the oil that may have fallen on his head.